The ‘first ever’ Wimborne History Festival project in 2016 helped local school children rediscover the Bronze Age, in their own back yard. St Michael’s School in Colehill, Wimborne had a hidden gem in its grounds, a Bronze Age Bell Barrow which had become overgrown with shrubbery and weeds. With Heritage Lottery Funding Wimborne History Festival was able to supply the necessary tools, and expertise in the form of eminent archaeologist Julian Richards and the East Dorset Antiquarian Society, so that the site could be cleared and the barrow visible from the school’s classrooms. 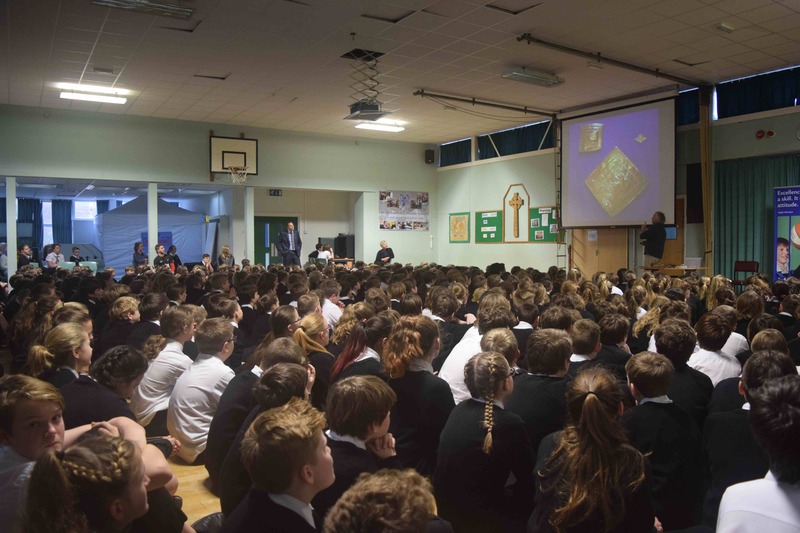 With tales of bodies and bones, and a range of replica tools and weapons, Julian Richards bought the Bronze Age to life for the School’s 510 pupils in a special assembly. The children were enthralled to learn about the Barrow in their school grounds, and what might lie within! To complete the project a number of children will work with Horrible Histories artist Martin Brown, to illustrate the history of the site, taking their inspiration from artefacts from the collections at Wimborne’s Priest’s House Museum. The final artwork will be used on an interpretive panel to be erected in the school grounds, a reminder to all of the importance, and perhaps the mysteries, of the past.